it seems to be a constant refrain that there’s a shortage of good nurses out there to keep up with the medical demands of a rapidly aging, growing, and changing population. 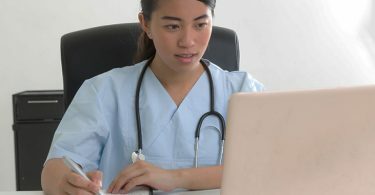 as the demand spikes for nurses, we’re also seeing more opportunities for a related, similarly in-demand professional: the certified nursing assistant (cna). 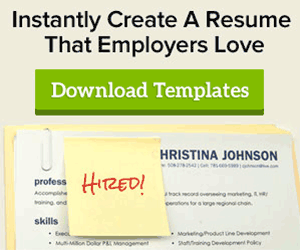 if you’re looking for a career change or a foothold in the healthcare industry, or are already well on your way as a cna, a great resume can help you take advantage of these strike-while-the-iron-is-hot opportunities. let’s look at three different cnas’ resumes: one just starting out, another in the middle of her career, and a third who’s looking to move on and up into an administrative position. first up is felix, our cna newbie. felix doesn’t yet have a ton of experience, so the most important purpose in his cna resume is making sure that the experience and skills he does have shine through. he has the necessary certification, which he’s careful to include in his education section, but it’s also important to frame his skills (which he does under “key strengths”) and make sure he’s using every bit of applicable experience. in this case, this means including his volunteer experience at the local senior center. he wasn’t necessarily paid for his time at the center, but he demonstrates and develops the skills he’ll need as a certified nursing assistant, so it’s a great idea to include that experience here. next up is charlotte, who has been a cna for eight years. a more traditional format (the reverse-chronological format, which puts experience front-and-center) works well for charlotte. she feels strongest about her experience, so that’s what she chooses to emphasize in her resume. remember: you’re not locked into this traditional format—if you think your skills shine brightest, put those first! last but not least, we have nancy, who’s been a certified nursing assistant for ten years, but is looking to jumpstart her healthcare career by shifting her focus to medical administration. 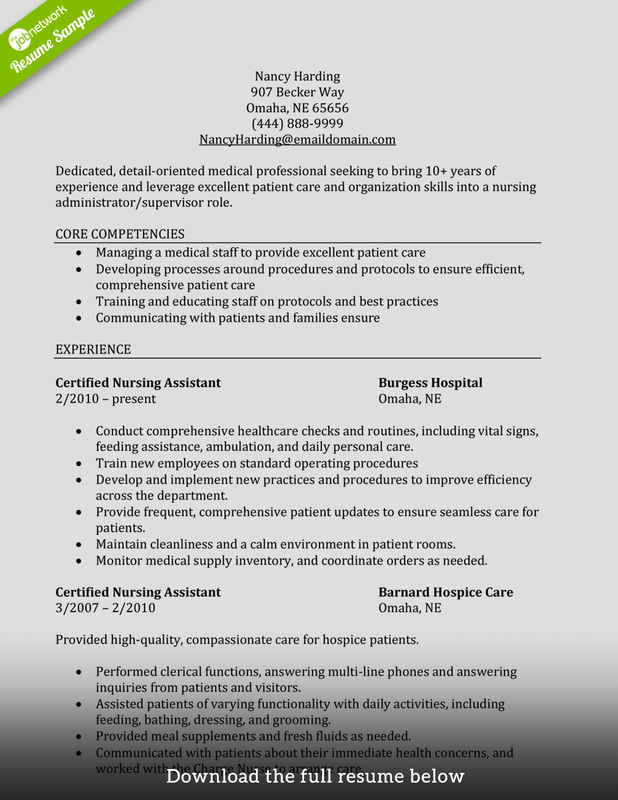 like the other cna resumes we’ve looked at, nancy’s make sure to emphasize all of the great care she’s provided to her patients over the years. however, because she’s also looking to change up her career path a little, she needs to make sure she’s emphasizing other, more universal skills that will serve her well as a medical administrator or nursing supervisor. to that end, nancy’s core competencies (or her job-specific skills) are heavy on management, organization, and administrative skills. and she’s up front about this: in her summary statement at the top, she tells the reader straight out that she wants to take her skills and experience into a slightly different role as assets. nancy’s bullet points are meant to show that she’s a good manager in addition to providing high-quality patient care; she makes sure to mention that she focuses on making procedures run more efficiently, and she mentions her hand in training others to work more efficiently as well. when you’re using your resume as a springboard into something new (even if it’s only a little bit outside of your experience), it’s important to do more than summarize your role and your responsibilities. make sure you’re picking action words to show how you’ve done these things, and that you’re tailoring your experience bullet points to the job you want, not necessarily the jobs you had. 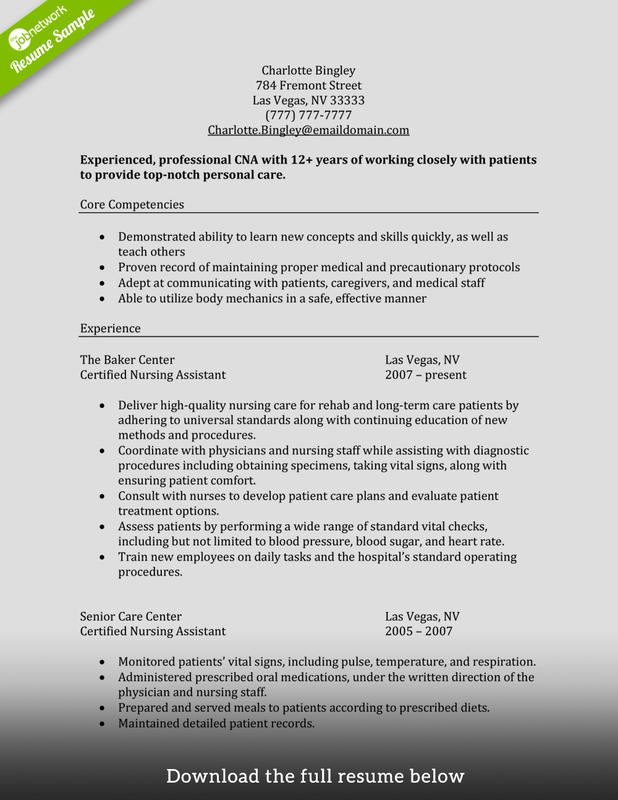 looking for cna jobs in your area? look no further! 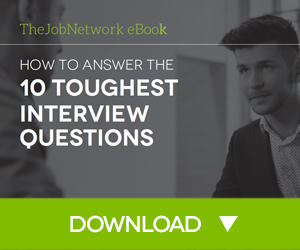 thejobnetwork has listings all over the country to meet your professional needs. 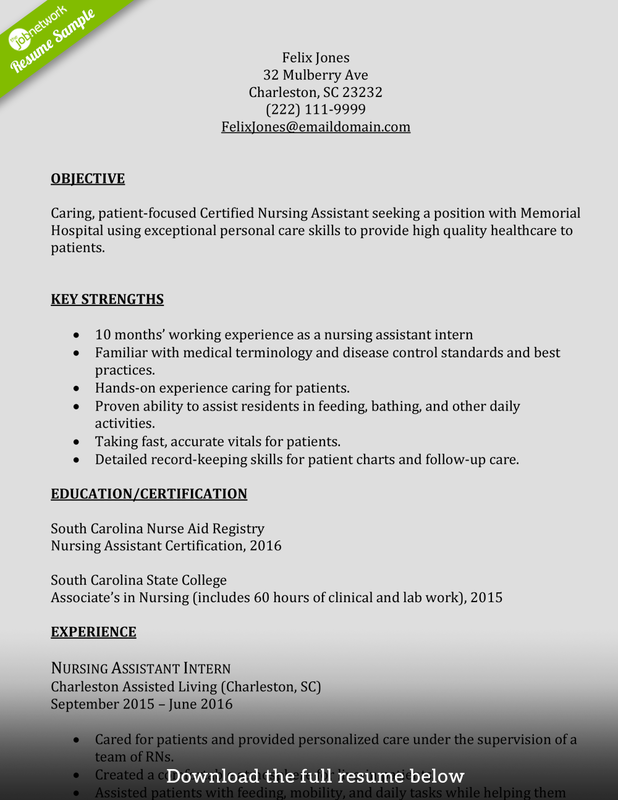 find certified nursing assistant jobs in your area.